Artificial Intelligence (AI) is here. But amidst the exciting prospect of AI improving our lives by making production and tedious tasks, like data analysis, more efficient, worry looms over job loss and the displacement of workers across a wide variety of industries. So how will industries cope and adapt to this change to ensure that their talent remains valuable and that integration creates more opportunity than risk? 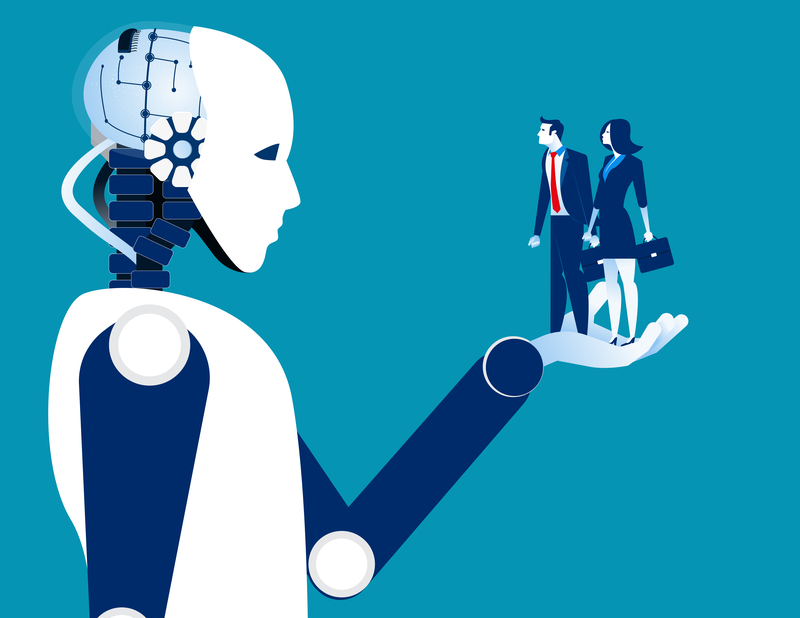 Kenneth Coates, a CEO and technology influencer, wrote a December 2018 column in Forbes, that quoted a Pew Research Study asking whether AI and robotics would create more jobs than it would destroy; respondents were evenly split. Other studies estimate anywhere from 14-54% of the U.S. workforce could see their jobs automated in the next two decades. AI expert, Kai Fu Lee, projects that 40 percent of current jobs worldwide will be replaced by robots and automation within the next 15 years, creating a job deficit and an even more highly competitive job market. However, new jobs will also be created, to build, program and maintain these new machines and intelligence systems; particularly in the fields of engineering, software design and programming. Despite major AI disruption, there are some jobs that ensure the normal functioning of society, where variables including emotional intelligence, data biases and human craft is necessary. Among these jobs, include policing, human resources, judges, lawyers, and artists. But these jobs will not go fully undisturbed by AI. The Pew study quoted in Forbes also found that 87% of workers believe they need to develop new job skills throughout their work life to keep up with the next technological revolution. History agrees. Automation and the Industrial Revolution were expected to eliminate jobs; in reality, the labor needs were transformed. AI systems will be implemented within these industries to improve efficiency of search and creation tools, to better gather and analyze data, and to propose probable outcomes from that data. AI will become an integrated tool in the social services industry, which will likely result in a stripping down of workers performing these re-assigned tasks. The jobs and lives of essential workers that will remain will benefit heavily from AI technology, giving them more time and resources to shift their focus to other tasks and priorities previously neglected. Among the suspected jobs to be lost or made obsolete include drivers, machine operators, fast food workers, construction and manual labor, data entry and financial analysts. These are laborious jobs that deal with either numbers or repetitive tasks, which AI can be easily and specifically designed to achieve in a much shorter time, at a much lower cost. While it is still uncertain about how much of the job deficit will be replaced by new jobs, we can already account for what jobs will be needed, just by looking at the kinds of technology being implemented to perform these tasks. Many experts recommend that the workers of the future nurture skills that AI is unlikely to replicate. These involve jobs that exploit creativity, abstract or critical thinking, social or emotional intelligence and, of course, programming and other roles tied to developing AI systems. New jobs will include: data detectives, robotics engineers, machine managers, digital tailors, coders and programmers, various industry brokers. Some of these jobs will correlate directly with the building and maintenance of robotics hardware or software and development. However, the extension of how this technology in managed, guided and used will be up to roles similar to those that already exist for humans, including: managers, legal and ethical advisors and boards, counselors, directors and administrators. These workers will need to learn how to manage both people and AI systems. Unfortunately, most jobs that will be replaced by AI technology, particularly automation, largely encompasses low-wage jobs. This means that the poverty rate is likely to increase as AI technology becomes more ubiquitous. An inflated poverty rate will ultimately decrease consumption, of the newly, efficiently produced goods and services, and governments will need to implement new strategies to encourage consumption. Due to the scope of change that AI technology is expected to induce, both individual industries and government program action will be required across society. The most notable changes needed to prepare industry employees for the changing work environment require both early education and industry-lead (re)education programs. Re-education in the form of training new talent or re-training existing talent may look something like the United Kingdom’s Government Supported National Retraining Scheme that proposed £100 million to support and expand apprenticeship programs for workers entering an industry. Another program includes an industry specific $100 million grant for global consulting company (and one of America’s largest technology employers), Cognizant, which aims to offer educational programs in the STEM field for both US workers and students. The latter of these programs would allow young adults and graduates the opportunity to enter more seamlessly into their STEM industry focus with the skills that the companies need, because the education programs will create curriculums that keep in pace with the evolution of each industry as AI changes it. Providing re-training programs has the potential to improve employee specialization and retention, and allows employees room to grow within a company, rather than competing for an alternatively-specialized horizontal position at another company within the same industry.